The Democratic Nurses Organisation of South Africa (Denosa) says the linen shortage at the Thelle Mogoerane Hospital in Vosloorus on the East Rand has raised fears of infections in the hospital. It says hospital linen needs to be changed daily to prevent the spread of infections. The linen shortage, which affects a number of hospitals, follows a breakdown in the laundry and boiler machines at the Dunswart laundry facility in Boksburg. The Gauteng Health Department says it hopes that the problem will be sorted by this weekend. Meanwhile, the Democratic Alliance (DA) Shadow Health MP Jack Bloom has called for the Gauteng Department of Health to urgently investigate the after some surgeries were cancelled due to a shortage of clean linen. Bloom says the incident has had a ripple effect. “I really think the Gauteng Health Department needs to urgently investigate why there’s a clean linen shortage at the Thelle Mogoerane hospital. It’s causing cancellations of operations, waiting lists are going to get longer and patients don’t have clean linen. 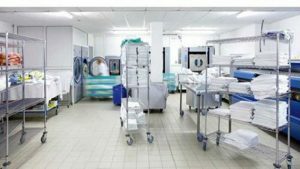 It really is very problematic that the state laundry run by the Gauteng Health Department is not providing reliable linen for hospitals,” says Bloom. The post Denosa decries linen shortage at East Rand hospital appeared first on SABC News – Breaking news, special reports, world, business, sport coverage of all South African current events. Africa's news leader..